"Famous Dave's Bar-B-Que" in Branson; the name says it all...famous! Still competing in BBQ competitions and loved by critics and customers alike, "Famous Dave's" has racked up more than 700 awards! They specialize in made-from-scratch barbecued meats that melt in your mouth! The pitmasters are up at 4:00 am to get their hickory logs smoldering for those carefully selected cuts of meat, all hand-rubbed with fresh seasonings. There are several original sauces to choose from, and sides galore! Try the BYOB - Build Your Own Barbecue - it's a fun and unique way to create a great meal by choosing from unique toppings. 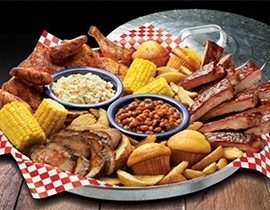 "Famous Dave's Bar-B-Que;" it's the longest-running backyard BBQ party in history!